Welcome to our pick of the best mesh Wi-Fi routers of 2019. Unlike traditional wireless routers which are usually single units that sit in one room and broadcast Wi-Fi to the rest of your house, the best wireless mesh routers comprise of a number of units that you can dot around your home, ensuring that there's strong Wi-Fi signal throughout the building. With the best wireless mesh routers, you just place several nodes in key areas of your home, and you’ll get a strong, unified Wi-Fi network no matter where you are. This is different from the way range extenders work, which just take the Wi-Fi signal from the best wireless routers and repeats it, extending its range. The problem with this approach it requires a separate SSID for the extender, as it’s essentially creating a second network. This is annoying, as your device won't automatically switch to the different network. Also, filling your home up with different Wi-Fi networks can have a negative impact on network performance. The best mesh Wi-Fi routers are easy to setup. Simply plug in the main unit to your internet connection, then with a few button presses you can pair up the other units, for one large – and fast – Wi-Fi network. However, the best wireless mesh routers can get expensive, and can require some technical know-how in order to figure out what’s best for your home. Luckily, we’ve got you covered. We went ahead and picked out the five best wireless mesh routers we’ve been fortunate enough to test and review. Let’s dive in, shall we? We’re not exaggerating when we say the Google Wifi isn’t just the best Wi-Fi mesh router we’ve ever used, but also the best wireless router period. 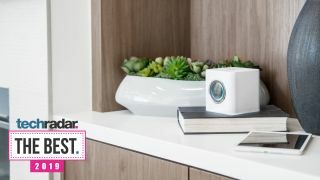 Not only does it have the power to push fast Wi-Fi throughout your home – despite how small it is – but it’s also affordable and easy to set-up at the same time. Seriously, all you have to do to setup Google Wifi is download an app to your smartphone, scan some QR codes and just place the nodes where you want them to go. It couldn’t be easier – Google has mastered the router game, it’s almost unfair. If you’ve got the cash for it, the Netgear Orbi might be one of the best Wi-Fi mesh routers on the market today. Instead of something like the Google Wifi, which uses three identical nodes to setup your network, you’ll get one main router, then a collection of nodes to plug into power outlets around your house. And, because of the sheer number of Ethernet ports found on the Orbi, it’s a great choice for anyone who has a lot of devices that need a hardwired connection – making it the best option for anyone who uses their network primarily for gaming. If you’re just looking for a way to spread Wi-Fi throughout your home and want to save a few bucks while you’re at it, you might want to take a look at the TP-Link Deco M5. It may not be as fast as some of the other Wi-Fi mesh routers on this list, but if you’re not necessarily worried about getting the maximum theoretical throughput – which you likely wouldn’t be able to take advantage of anyway – it shouldn’t be much of an issue. Setup, much like the other devices here, is a breeze and is approachable even if you don’t know anything about tech. The TP-Link Deco M5 might be one of the best Wi-Fi mesh routers for anyone intimidated by technology. If you’re the kind of person that gets into Apple’s design philosophy and you like having chic gadgets set up throughout your home, without paying much attention to the price – the Ubiquiti Amplifi HD will be right up your alley. If you live in a large home, and can take advantage of the full power that this mesh Wi-Fi setup offers, you’ll find a lot to love, as it’s capable of a huge amount of throughput. However, you might find that the value diminishes quite a bit when you live in a small to medium space, as there are more cost-effective methods available, but they don’t look quite as good. The Ubiquiti Amplifi HD may be expensive, but you’re paying for a piece of tech that has both style and substance – we think it’s worth it. While it’s expensive and not as powerful as the rest of the Wi-Fi mesh routers, there’s something to be said about the simplicity that the Linksys Velop affords. It may be more expensive than the competition, but the Velop will appeal to people who need to set up a Wi-Fi network without the headache of, well, setting it up. More tech-savvy users probably won’t be interested – why spend the money when you can do all the work yourself, right? For most people, though, the Linksys Velop is going to be an excellent choice. It’s also fully modular, so you only have to pick up as many nodes as you actually need – one node will cover up to 2,000 square feet.